Worm is becoming a classic of the prose grimdark superhero genre. That's not that large a category (though it contains other great fiction like the Reckoners trilogy), but the size of the category does not diminish Worm's accomplishment. Let's go through some of the reasons Worm is a classic in the making, shall we? Structural Innovations: As far as I can tell, Worm originated the Arc/Interlude format for web serials. If that doesn't make it a classic, what does? Setting: The setting has incredible depth. Many of the normal superhero tropes are carefully justified within the setting, and the powers themselves are well thought out and varied. Prose Quality: The writing has very good spelling and grammar. It is also just engaging o read on a sentence by sentence basis. One nitpick: the author sometimes overuses certain words that are rare in real life. Plot: The plot constantly escalates in danger in scope. If you like stories that become epic, Worm is one to go for. However, some parts drag out the action to the point where it can be hard to push through. Character Development: Character development in the Interludes is fantastic. Sadly, it doesn't always translate to the main story. 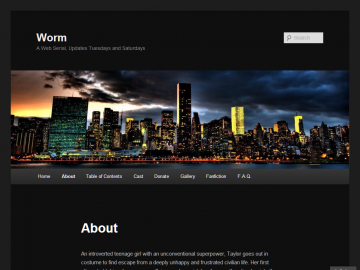 If you are at all interested in superhero fiction, you've probably checked Worm out already. If you haven't, you will.